On Sunday May 6th, the world will be getting up early to celebrate International Dawn Chorus Day. We’ll be getting up extra early – a whole week early in fact for our own Island celebration of one of nature’s greatest marvels.. Dawn Chorus Magic. Each year, timed to support the Isle of Wight Walking Festival, Ian Boyd leads us out to the wild fringes of Sandown Bay and along the banks of the Eastern Yar. Setting off in darkness means we’re there just in time for the one by one wake-up calls of a host of resident and migrant songbirds. It’s a symphony of sound alright and just to listen to each bird’s song building up as the sun rises is wonderful. But there’s a whole language and meaning to uncover behind the Dawn Chorus and with Ian’s expert help, we discover more every time about the wonder, and the fragility, of bird life and song. 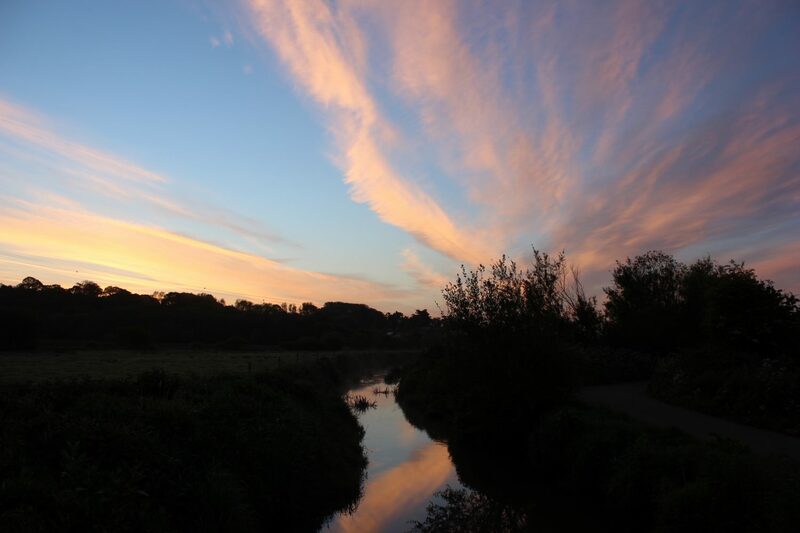 The Dawn Chorus is all about establishing territory – that’s territory for feeding, breeding and refuge; each bird species, the shouting early birds in particular, are advertising and challenging and setting out the space they need to survive. A Dawn Chorus can be short or long, loud and intense or quiet and subdued – no two symphonies are the same. Often this’ll depend on how much energy the birds have – a sunny day with a hive of invertebrate activity and the corresponding rich pickings, means there’s more energy to belt out your tunes the following morning. And if it sounds a bit discordant sometimes, that’s because not all your singers are in tune or getting the lyrics right! There’s a whole range of sub-songs made up by juvenile birds learning the notes and phrases but who just holler nonsense until one morning they get it spot-on. Interestingly, it’s eye size that can determine who wakes and sings first. And talking of eye tunes (groan! ), technology means we can now ID bird song and sub-song, relate it to the species and even to geographical variance. We are fascinated by the website, https://www.xeno-canto.org/. Amazing stuff. Not all modern developments are good however and as we walk, we learn why we should never take the Dawn Chorus for granted. Bird species have declined, in some cases, catastrophically, over the last 50 years, and some of those once common contributors are now red-list species. Last year, we were stunned by the liquid song of a nightingale but also incredibly lucky to hear it, given its scarcity. Back to territories again. As Ian explains, a territory isn’t just a space to sing around – it’s where birds get all their food and it’s got to sustain life, so nibbling away at a corner of it for development, agriculture or forestry work can be incredibly disruptive. Even swapping a hedge for a fence, sealing your house soffits or concreting over your front garden so you can park outside your lounge window is by increments having an enormous impact on bird life and song. The absolute importance of territory (and that includes air space) as a minimum ecological unit to support each family of birds can’t be underestimated. There’s loads of ways to support and reset the balance however. #ShapingBetterPlaces we call it, rewilding urban green spaces, building in space for biodiversity into the very fabric of our towns and cities informs our work across our sister organisations, Arc, Artecology and The Common Space (more on all that later). The government’s 25 Year Plan and the work of many wildlife organisations and individuals are working to address the situation, particularly with Brexit and the necessity of replacing EU legislation coming up. But there’s no time to waste! Every positive action, starting simply with your home and garden, ecological hot spots as they are, can play a part in keeping that Dawn Chorus magic. Why not join us on Sunday 29th April at 4.30am and hear all about it for yourself. It’s unmissable! For details, visit our upcoming events page. Part of the Discovery Bay Calendar of events.